For the 11th century battle in the Byzantine conquest of the Mezzogiorno, see Battle of Cannae (1018). 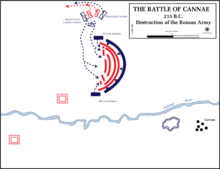 The Battle of Cannae (/ˈkæni, -eɪ, -aɪ/)[b] was a major battle of the Second Punic War that took place on 2 August 216 BC in Apulia, in southeast Italy. The army of Carthage, under Hannibal, surrounded and decisively defeated a larger army of the Roman Republic under the consuls Lucius Aemilius Paullus and Gaius Terentius Varro. It is regarded both as one of the greatest tactical feats in military history and as one of the worst defeats in Roman history. Having recovered from their losses at Trebia (218 BC) and Lake Trasimene (217 BC), the Romans decided to engage Hannibal at Cannae, with approximately 86,000 Roman and allied troops. They massed their heavy infantry in a deeper formation than usual, while Hannibal used the double-envelopment tactic and surrounded his enemy, trapping the majority of the Roman army, who were then slaughtered. The loss of life on the Roman side was one of the most lethal single day's fighting in history; Adrian Goldsworthy equates the death toll at Cannae to "the massed slaughter of the British Army on the first day of the Somme offensive in 1916." Only about 15,000 Romans, most of whom were from the garrisons of the camps and had not taken part in the battle, escaped death. Following the defeat, Capua and several other Italian city-states defected from the Roman Republic to Carthage. As news of this defeat reached Rome, the city was gripped in panic. Authorities resorted to extraordinary measures, which included consulting the Sibylline Oracles, dispatching a delegation led by Quintus Fabius Pictor to consult the Delphic oracle in Greece, and burying four people alive as a sacrifice to their Gods. To raise two new legions, the authorities lowered the draft age and enlisted criminals, debtors and even slaves. Despite the extreme loss of men and equipment, and a second massive defeat later that same year at Silva Litana, the Romans refused to surrender to Hannibal. His offer to ransom survivors was brusquely refused. With grim determination the Romans fought for 14 more years until they achieved victory at the Battle of Zama. Although for most of the following decades the battle was seen solely as a major Roman disaster, by modern times Cannae acquired a mythic quality, and is often used as an example of the perfect defeat of an enemy army. It was studied by German strategists prior to World War II, and General Norman Schwartzkopf claimed to have drawn inspiration from Hannibal's success for his devastatingly effective land offensive in the First Gulf War. Shortly after the start of the Second Punic War, Hannibal crossed into Italy by traversing the Pyrenees and the Alps during the summer and early autumn of 218 BC. He quickly won major victories over the Romans at Trebia and at Lake Trasimene. After these losses, the Romans appointed Quintus Fabius Maximus Verrucosus as dictator to deal with the threat. Fabius used attrition warfare against Hannibal, cutting off his supply lines and avoiding pitched battles. These tactics proved unpopular with the Romans who, as they recovered from the shock of Hannibal's victories, began to question the wisdom of the Fabian strategy, which had given the Carthaginian army a chance to regroup. The majority of Romans were eager to see a quick conclusion to the war. It was feared that, if Hannibal continued plundering Italy unopposed, Rome's allies might defect to the Carthaginian side for self-preservation. The Senate determined to bring eight legions into the field, which had never been done at Rome before, each legion consisting of five thousand men besides allies. ...Most of their wars are decided by one consul and two legions, with their quota of allies; and they rarely employ all four at one time and on one service. But on this occasion, so great was the alarm and terror of what would happen, they resolved to bring not only four but eight legions into the field. Rome typically employed four legions each year, each consisting of 4,000 foot soldiers and 200 cavalry. Perceiving the Carthaginian army as a real threat, for the first time ever the Senate introduced eight legions, each consisting of 5,000 foot soldiers and 300 cavalry, with allied troops numbering the same amount of foot soldiers but 900 cavalry per legion—more than triple the legion numbers. Eight legions—some 40,000 Roman soldiers and an estimated 2,400 cavalry—formed the core of this massive new army. Livy quotes one source stating the Romans added only 10,000 men to their usual army. While no definitive number of Roman troops exists, all sources agree that the Carthaginians faced a considerably larger foe. Consuls were each assigned two of the four legions to command, rarely employing all four legions at once to the same assignment. However, the Senate feared a real threat and not only deployed all four legions to the field but all eight, including allies. Ordinarily, each of the two consuls would command his own portion of the army, but since the two armies were combined into one, Roman law required them to alternate their command on a daily basis. The traditional account puts Varro in command on the day of the battle, and much of the blame for the defeat has been laid on his shoulders. However, his low origins seem to be exaggerated in the sources, and Varro may have been made a scapegoat by the aristocratic establishment. 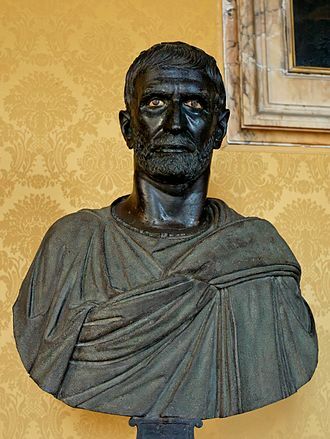 He lacked the powerful descendants that Paullus had, descendants who were willing and able to protect his reputation—most notably, Paullus was the grandfather of Scipio Aemilianus, the patron of Polybius (one of the main sources of this history). In the spring of 216 BC Hannibal took the initiative and seized the large supply depot at Cannae, in the Apulian plain, placing himself between the Romans and their crucial source of supply. As Polybius noted, the capture of Cannae "caused great commotion in the Roman army; for it was not only the loss of the place and the stores in it that distressed them, but the fact that it commanded the surrounding district". 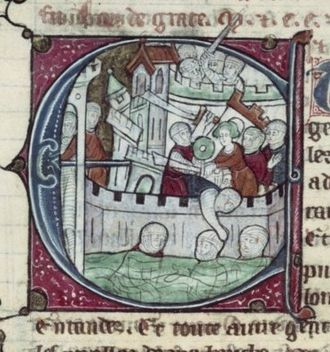 The consuls, resolving to confront Hannibal, marched southward in search of him. After two days' march, they found him on the left bank of the river Aufidus, and encamped five miles (8 km) away. Varro, in command on the first day, is presented by contemporary sources as a man of reckless nature and hubris, who was determined to defeat Hannibal. While the Romans were approaching Cannae, some of Hannibal's light infantry and cavalry ambushed them. Varro repelled the attack and continued slowly on his way to Cannae. This victory, though essentially a mere skirmish with no lasting strategic value, greatly bolstered the confidence of the Roman army, perhaps leading to overconfidence on Varro's part. Paullus, however, was opposed to the engagement as it was taking shape. Unlike Varro, he was prudent and cautious, and he believed it was foolish to fight on open ground, despite the Romans' numerical strength. This was especially true since Hannibal held the advantage in cavalry (both in quality and quantity). Despite these misgivings, Paullus thought it unwise to withdraw the army after the initial success, and camped two-thirds of the army east of the river Aufidus, sending the remainder to fortify a position on the opposite side one mile (2 km) away from the main camp. The purpose of this second camp was to cover the foraging parties from the main camp and harass those of the enemy. The two armies stayed in their respective locations for two days. During the second day (August 1) Hannibal, aware that Varro would be in command the following day, left his camp and offered battle, but Paullus refused. When his request was rejected, Hannibal, recognizing the importance of water from the Aufidus to the Roman troops, sent his cavalry to the smaller Roman camp to harass water-bearing soldiers that were found outside the camp fortifications. According to Polybius, Hannibal's cavalry boldly rode up to the edge of the Roman encampment, causing havoc and thoroughly disrupting the supply of water to the Roman camp. On the morning of the battle, as the forces drew up, a Carthaginian officer named Gisgo reportedly remarked to Hannibal that the size of the Roman army was astonishing. "There is one thing, Gisgo, yet more astonishing", Hannibal coolly replied, "which you take no notice of." He then explained, "In all those great numbers before us, there is not one man called Gisgo", provoking laughter that spread through the Carthaginian ranks. Ancient historians rarely provide the precise dates for the events they describe; for example, Livy provides no explicit dates for any of the battles of the Second Punic War. However, Macrobius, citing the Roman annalist Quintus Claudius Quadrigarius, states the battle was fought ante diem iiii nones Sextilis, or 2 August. The months of the pre-Julian Roman calendar are known not to correspond to its namesake Julian day; for example, Livy records a lunar eclipse in 168 BC as occurring on 4 September, when astronomical calculations show it happened on Julian day 21 June of that year. This discrepancy arose from the failure of the pontifices to properly perform intercalations, either by accident or for political advantage. A review of the evidence led P.S. Derow to identify the equivalent Julian date would be 1 July 216 BC; other authorities have suggested other Julian dates. Figures for troops involved in ancient battles are often unreliable, and Cannae is no exception. They should be treated with caution, especially those for the Carthaginian side. The Carthaginian army was a combination of warriors from numerous regions, and may have numbered between 40,000–50,000. Along with the core of an estimated 8,000 Libyans, there were 8,000 Iberians, 16,000 Gauls (8,000 were left at camp the day of battle) and around 5,500 Gaetulian infantry. Hannibal's cavalry also came from diverse backgrounds. He commanded 4,000 Numidian, 2,000 Iberian, 4,000 Gallic and 450 Libyan-Phoenician cavalry. Finally, Hannibal had around 8,000 skirmishers consisting of Balearic slingers and mixed-nationality javelinmen. The uniting factor for the Carthaginian army was the personal tie each group had with Hannibal. Rome's forces used typical Roman equipment including pila (heavy javelins) and hastae (thrusting spears) as weapons as well as traditional bronze helmets, bodyshields and body armor. On the other hand, the Carthaginian army used a variety of equipment. The Iberians fought with swords suited for cutting and thrusting, as well as javelins and various types of spears. 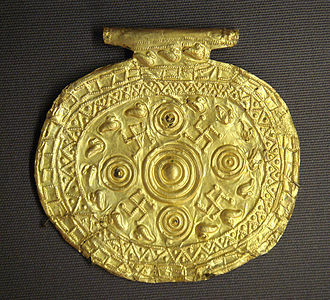 For defense, Iberian warriors carried large oval shields and often wore a crested helmet made of animal sinews. Most Gallic foot warriors likely had no protection other than their shields, and the typical Gallic weapon was a long slashing sword. The heavy Gallic cavalry used the four-horned saddle, with the wealthier ones being clad in mail, a Gallic invention. The Numidian cavalry were very lightly equipped, lacking saddles and bridles for their horses, and wearing no armor but carrying small shields, javelins and possibly a knife or a longer blade. Skirmishers acting as light infantry carried either slings or javelins. The Balearic slingers, who were famous for their accuracy, carried short, medium and long slings used to cast stones or bullets. They may have carried a small shield or simple leather pelt on their arms, but this is uncertain. 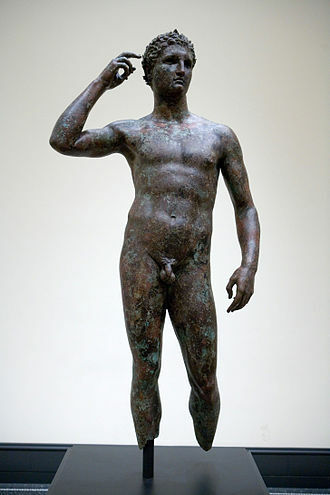 Hannibal himself, like many Roman officers on the opposing side, might have been wearing a bronze musculata and carrying a falcata as his personal sidearm. The equipment of the Libyan line infantry has been much debated. Duncan Head has argued in favor of short stabbing spears. Polybius states that the Libyans fought with equipment taken from previously defeated Romans. It is unclear whether he meant only shields and armor or offensive weapons as well, though a general reading suggests he meant the whole panoply of arms and armor, and even tactical organization. Apart from his description of the battle itself, when later discussing the subject of the Roman legion versus the Greek phalanx, Polybius says that " . . . against Hannibal, the defeats they suffered had nothing to do with weapons or formations" because "Hannibal himself . . . discarded the equipment with which he had started out [and] armed his troops with Roman weapons". Gregory Daly is inclined to the view that Libyan infantry would have copied the Iberian use of the sword during their fighting there and so were armed similarly to the Romans. Peter Connolly has argued that they were armed as a pike phalanx. 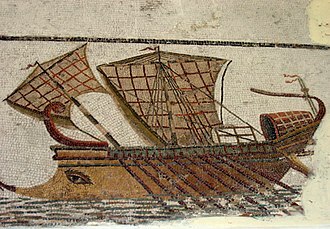 This has been disputed by Head, because Plutarch states they carried spears shorter than the Roman triarii and by Daly because they could not have carried an unwieldy pike at the same time as a heavy Roman-style shield. The conventional deployment for armies of the time was placement of infantry in the center, with the cavalry in two flanking wings. The Romans followed this convention fairly closely, but chose extra depth rather than breadth for the infantry in hopes of breaking quickly through the center of Hannibal's line. Varro knew how the Roman infantry had managed to penetrate Hannibal's center at Trebia, and he planned to recreate this on an even greater scale. The principes were stationed immediately behind the hastati, ready to push forward at first contact to ensure the Romans presented a unified front. As Polybius wrote, "the maniples were nearer each other, or the intervals were decreased . . . and the maniples showed more depth than front". Even though they outnumbered the Carthaginians, this depth-oriented deployment meant that the Roman lines had a front of roughly equal size to their numerically inferior opponents. The typical style of ancient warfare was to continuously pour infantry into the center and attempt to overpower the enemy. Hannibal understood that the Romans fought their battles like this, and he took his outnumbered army and strategically placed them around the enemy to win a tactical victory. Hannibal had deployed his forces based on the particular fighting qualities of each unit, taking into consideration both their strengths and weaknesses. This aspect of Hannibal's leadership was highlighted in the use of a Spanish unit, the Balearic slingers, whom he placed behind the infantry to hurl their ranged missiles into the masses of Roman troops. He placed his Iberians and Gauls in the middle, alternating the ethnic composition across the front line, with himself at the front and center. Infantry from Punic Africa was on the wings at the very edge of his infantry line. These infantry were battle-hardened, remained cohesive and would attack the Roman flanks. Hasdrubal led the Iberian and Gallic cavalry on the left (south near the river Aufidus) of the Carthaginian army. By placing the flank of his army on the Aufidus, Hannibal prevented this flank from being overlapped by the more numerous Romans. Hasdrubal was given 6,000–7,000 cavalry, and Hanno had 3,000–4,000 Numidians on the right. Hannibal intended that his cavalry, comprising mainly medium Hispanic cavalry and Numidian light horse, and positioned on the flanks, would defeat the weaker Roman cavalry and swing around to attack the Roman infantry from the rear as it pressed upon Hannibal's weakened center. His veteran African troops would then press in from the flanks at the crucial moment, and encircle the overextended Romans. The Romans were in front of the hill leading to Cannae and hemmed in on their right flank by the river Aufidus, so that their left flank was the only viable means of retreat. In addition, the Carthaginian forces had maneuvered so that the Romans would face east. Not only would the morning sun shine low into the Romans' eyes, but the southeasterly winds would blow sand and dust into their faces as they approached the battlefield. 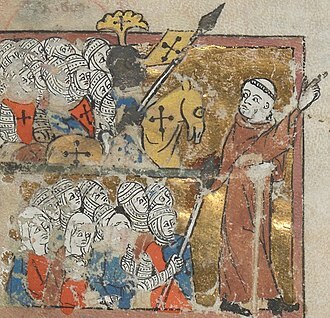 Hannibal's deployment of his army, based on his perception of the terrain and understanding of the capabilities of his troops, proved decisive. As the armies advanced on one another, Hannibal gradually extended the center of his line, as Polybius described: "After thus drawing up his whole army in a straight line, he took the central companies of Hispanics and Celts and advanced with them, keeping the rest of them in contact with these companies, but gradually falling off, so as to produce a crescent-shaped formation, the line of the flanking companies growing thinner as it was prolonged, his object being to employ the Africans as a reserve force and to begin the action with the Hispanics and Celts." Polybius described the weak Carthaginian center as deployed in a crescent, curving out toward the Romans in the middle with the African troops on their flanks in echelon formation. It is believed that the purpose of this formation was to break the forward momentum of the Roman infantry, and delay its advance before other developments allowed Hannibal to deploy his African infantry most effectively. While the majority of historians feel that Hannibal's action was deliberate, some have called this account fanciful, and claim that the actions of the day represent either the natural curvature that occurs when a broad front of infantry marches forward, or the bending back of the Carthaginian center from the shock action of meeting the heavily massed Roman center. The battle began with a fierce cavalry engagement on the flanks. 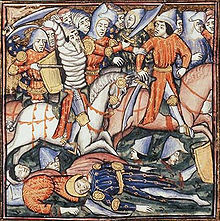 Polybius described many of the Hispanic and Celtic horsemen facing the Romans dismounting due to the lack of space to fight on horseback, and called the struggle "barbaric" in the sense of its utter brutality. When the Iberians and Gauls got the upper hand, they cut down the Roman cavalry without giving quarter. On the other flank the Numidians engaged in a way that merely kept the Roman allied cavalry occupied. Hasdrubal kept his victorious Hispanic and Gallic cavalry under control and did not chase the retreating Roman right wing. Instead, he led them to the other side of the field to attack the socii cavalry still fighting the Numidians. Assailed from both sides, the allied cavalry broke before Hasdrubal could charge into contact and the Numidians pursued them off the field. While the Carthaginian cavalry were in the process of defeating the Roman horsemen, the masses of infantry on both sides advanced towards each other in the center of the field. The wind from the east blew dust in the Romans' faces and obscured their vision. While the wind was not a major factor, the dust that both armies created would have been potentially debilitating to sight. Although it made seeing difficult, troops would still have been able to see others in the vicinity. The dust, however, was not the only psychological factor involved in battle. Because of the somewhat distant battle location, both sides were forced to fight on little sleep. Another Roman disadvantage was thirst caused by Hannibal's attack on the Roman encampment during the previous day. Furthermore, the massive number of troops would have led to an overwhelming amount of background noise. All of these psychological factors made battle especially difficult for the infantrymen. The light infantry on both sides engaged in indecisive skirmishing, inflicting few casualties and quickly withdrawing through the ranks of their heavy infantry. As the Roman heavy infantry attacked, Hannibal stood with his men in the weak center and held them together in a controlled retreat. The crescent of Hispanic and Gallic troops buckled inwards as they gradually withdrew step by step. Knowing the superiority of the Roman infantry, Hannibal had instructed his infantry to withdraw deliberately, creating an even tighter semicircle around the attacking Roman forces. By doing so, he had turned the strength of the Roman infantry into a weakness. While the front ranks were gradually advancing, the bulk of the Roman troops began to lose their cohesion, as troops from the reserve lines advanced into the growing gaps. Soon they were compacted together so closely that they had little space to wield their weapons. In pressing so far forward in their desire to destroy the retreating and seemingly collapsing line of Hispanic and Gallic troops, the Romans had ignored (possibly due to the dust) the African troops that stood uncommitted on the projecting ends of this now-reversed crescent. This also gave the Carthaginian cavalry time to drive the Roman cavalry off on both flanks and attack the Roman center in the rear. The Roman infantry, now stripped of protection on both its flanks, formed a wedge that drove deeper and deeper into the Carthaginian semicircle, driving itself into an alley formed by the African infantry on the wings. At this decisive point, Hannibal ordered his African infantry to turn inwards and advance against the Roman flanks, creating an encirclement in one of the earliest known examples of a pincer movement. When the Carthaginian cavalry attacked the Romans in the rear and the African flanking echelons assailed them on their right and left, the advance of the Roman infantry was brought to an abrupt halt. The Romans were henceforth enclosed in a pocket with no means of escape. The Carthaginians created a wall and began to systematically massacre them. Polybius wrote: "as their outer ranks were continually cut down, and the survivors forced to pull back and huddle together, they were finally all killed where they stood." As Livy described, "So many thousands of Romans were dying... Some, whom their wounds, pinched by the morning cold, had roused, as they were rising up, covered with blood, from the midst of the heaps of slain, were overpowered by the enemy. Some were found with their heads plunged into the earth, which they had excavated; having thus, as it appeared, made pits for themselves, and having suffocated themselves." Victor Davis Hanson claims that nearly six hundred legionaries were slaughtered each minute until darkness brought an end to the bloodletting. Only 14,000 Roman troops managed to escape, most of whom had cut their way through to the nearby town of Canusium. Polybius writes that of the Roman and allied infantry, 70,000 were killed, 10,000 captured, and "perhaps" 3,000 survived. He also reports that of the 6,000 Roman and allied cavalry, only 370 survived. Livy wrote, "Forty-five thousand and five hundred foot, two thousand seven hundred horse, there being an equal number of citizens and allies, are said to have been slain." He also reports that 3,000 Roman and allied infantry and 1,500 Roman and allied cavalry were taken prisoner by the Carthaginians. Another 2,000 Roman fugitives were rounded up at the unfortified village of Cannae by Carthaginian cavalry commanded by Carthalo, 7,000 fell prisoner in the smaller Roman camp and 5,800 in the larger. Although Livy does not cite his source by name, it is likely to have been Quintus Fabius Pictor, a Roman historian who fought in and wrote on the Second Punic War. It is Pictor whom Livy names when reporting the casualties at the Battle of Trebia. In addition to the consul Paullus, Livy goes on to record that among the dead were 2 quaestors, 29 of the 48 military tribunes (some of consular rank, including the consul of the previous year, Gnaeus Servilius Geminus, and the former Magister equitum, Marcus Minucius Rufus), and 80 "senators or men who had held offices which would have given them the right to be elected to the Senate". 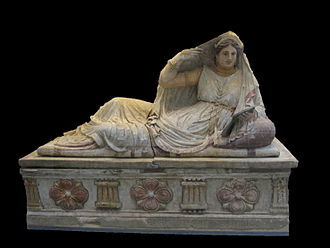 Later Roman and Greco-Roman historians largely follow Livy's figures. Appian gave 50,000 killed and "a great many" taken prisoner. Plutarch agreed, "50,000 Romans fell in that battle... 4,000 were taken alive". Quintilian: "60,000 men were slain by Hannibal at Cannae". Eutropius: "20 officers of consular and praetorian rank, 30 senators, and 300 others of noble descent, were taken or slain, as well as 40,000 foot-soldiers, and 3,500 horse". Some modern historians, while rejecting Polybius's figure as flawed, are willing to accept Livy's figure. Other historians have come up with far lower estimates. In 1891, Cantalupi proposed Roman losses of 10,500 to 16,000. Samuels in 1990 also regarded Livy's figure as far too high, on the grounds that the cavalry would have been inadequate to prevent the Roman infantry escaping to the rear. He doubts that Hannibal even wanted a high death toll, as much of the army consisted of Italians whom Hannibal hoped to win as allies. Livy recorded Hannibal's losses at "about 8,000 of his bravest men." Polybius reports 5,700 dead: 4,000 Gauls, 1,500 Spanish and Africans, and 200 cavalry. 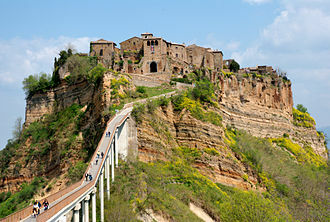 Never when the city was in safety was there so great a panic and confusion within the walls of Rome. I shall therefore shrink from the task, and not attempt to relate what in describing I must make less than the reality. The consul and his army having been lost at the Trasimenus the year before, it was not one wound upon another which was announced, but a multiplied disaster, the loss of two consular armies, together with the two consuls: and that now there was neither any Roman camp, nor general nor soldiery: that Apulia and Samnium, and now almost the whole of Italy, were in the possession of Hannibal. No other nation surely would not have been overwhelmed by such an accumulation of misfortune. For a brief period, the Romans were in complete disarray. Their best armies in the peninsula were destroyed, the few remnants severely demoralized, and the only remaining consul (Varro) completely discredited. As the story goes, Rome declared a national day of mourning as there was not a single person who was not either related to or acquainted with a person who had died. The Romans became so desperate that they resorted to human sacrifice, twice burying people alive at the Forum of Rome and abandoning an oversized baby in the Adriatic Sea (perhaps one of the last instances of human sacrifices by the Romans, apart from public executions of defeated enemies dedicated to Mars). Philip V of Macedon pledged his support to Hannibal following the Carthaginian victory. Within just three campaign seasons (20 months), Rome had lost one-fifth (150,000) of the entire population of male citizens over 17 years of age. Furthermore, the morale effect of this victory was such that most of southern Italy joined Hannibal's cause. After Cannae, the Hellenistic southern provinces of Arpi, Salapia, Herdonia, Uzentum, including the cities of Capua and Tarentum (two of the largest city-states in Italy) revoked their allegiance to Rome and pledged their loyalty to Hannibal. As Livy noted, "How much more serious was the defeat of Cannae than those which preceded it, can be seen by the behavior of Rome's allies; before that fateful day, their loyalty remained unshaken, now it began to waver for the simple reason that they despaired of Roman power." 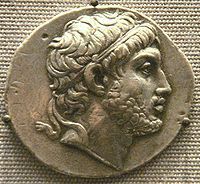 That the same year the Greek cities in Sicily were induced to revolt against Roman political control, while the Macedonian king, Philip V, pledged his support to Hannibal, initiating the First Macedonian War against Rome. Hannibal also secured an alliance with the new King Hieronymus of Syracuse, the only independent king left in Sicily. Livy illustrates the state of Roman morale with two vivid anecdotes. 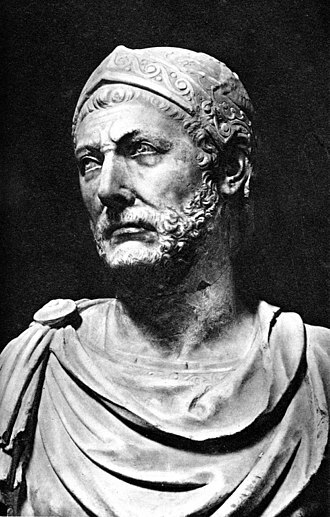 The first concerns Hannibal's brother Mago, who had returned to Carthage with news of the victory. He reported to their senate that in several engagements with the Romans Hannibal had killed over 200,000 soldiers and taken 50,000 prisoner; of six commanders, two consuls and a Master of horse had been slain; and a number of Roman allies had gone over to the Carthaginians. Then Mago concluded his report by having a collection of golden rings poured upon the council floor in front of the assembled senators. He explained that each ring belonged to one equites who had been slain in battle and had earned the ring through exceptional bravery. Livy notes one unnamed authority stated the volume of jewelry amounted to three and one-half measures (Congius? ), only to add "it is generally and more credibly held that there was not more than one measure of them". I swear with all the passion in my heart that I will never desert our homeland, or permit any other citizen of Rome to leave her in the lurch. If I willfully break my oath may Jupiter, Greatest and Best, bring me to a shameful death, with my house, my family, and all I possess! Swear the same oath, Caecilius! And the rest of you, swear it too. If anyone refuse, against him this sword is drawn. Following the battle, the commander of the Numidian cavalry, Maharbal, urged Hannibal to seize the opportunity and march immediately on Rome. It is told that the latter's refusal caused Maharbal's exclamation: "Of a truth the gods have not bestowed all things upon the same person. You know how to conquer, Hannibal; but you do not know how to make use of your victory." Hannibal had good reasons to judge the strategic situation after the battle differently from Maharbal. As the historian Hans Delbrück pointed out, due to the high numbers of killed and wounded among its ranks, the Punic army was not in a condition to perform a direct assault on Rome. It would have been a fruitless demonstration that would have nullified the psychological effect of Cannae on the Roman allies. Even if his army was at full strength, a successful siege of Rome would have required Hannibal to subdue a considerable part of the hinterland to cut the enemy's supplies and secure his own. Even after the tremendous losses suffered at Cannae and the defection of a number of her allies, Rome still had abundant manpower to prevent this and maintain considerable forces in Iberia, Sicily, Sardinia and elsewhere despite Hannibal's presence in Italy. Hannibal's conduct after the victories at Trasimene (217 BC) and Cannae, and the fact that he first attacked Rome only five years later, in 211 BC, suggests that his strategic aim was not the destruction of his foe but to dishearten the Romans by carnage on the battlefield and to wear them down to a moderate peace agreement by stripping them of their allies. Immediately after Cannae, Hannibal sent a delegation led by Carthalo to negotiate a peace treaty with the Senate on moderate terms. Despite the multiple catastrophes Rome had suffered, the Senate refused to parley. Instead, they redoubled their efforts, declaring full mobilization of the male Roman population, and raised new legions, enlisting landless peasants and even slaves. So firm were these measures that the word "peace" was prohibited, mourning was limited to only 30 days, and public tears were prohibited even to women. :386 For the remainder of the war in Italy, they did not amass such large forces under one command against Hannibal; they used several independent armies, still outnumbering the Punic forces in numbers of armies and soldiers. The war still had occasional battles, but was focused on taking strongpoints and constant fighting according to the Fabian strategy. This finally forced Hannibal with his shortage of manpower to retreat to Croton from where he was called to Africa for the battle of Zama, ending the war with a complete Roman victory. 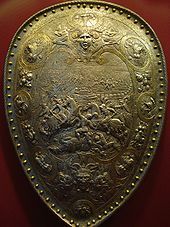 Shield of Henry II of France depicting Hannibal's victory at Cannae, an allusion to France's conflict with the Holy Roman Empire during the 16th century. Cannae played a major role in shaping the military structure and tactical organization of the Roman Republican army. At Cannae, the Roman infantry assumed a formation similar to the Greek phalanx. This left them vulnerable to Hannibal's tactic of double envelopment since their inability to maneuver independently from the mass of the army made it impossible for them to counter the strategic encirclement used by the Carthaginian cavalry. The laws of the Roman state requiring command to alternate between the two consuls restricted strategic consistency. In the years following Cannae, striking reforms were introduced to address these deficiencies. First, the Romans "articulated the phalanx, then divided it into columns, and finally split it up into a great number of small tactical bodies that were capable, now of closing together in a compact impenetrable union, now of changing the pattern with consummate flexibility, of separating one from the other and turning in this or that direction." For instance, at Ilipa and Zama, the principes were formed up well to the rear of the hastati—a deployment that allowed a greater degree of mobility and maneuverability. The culminating result of this change marked the transition from the traditional manipular system to the cohort under Gaius Marius, as the basic infantry unit of the Roman army. In addition, a unified command came to be seen as a necessity. After various political experiments, Scipio Africanus was made general-in-chief of the Roman armies in Africa, and was assured this role for the duration of the war. This appointment may have violated the constitutional laws of the Roman Republic but, as Delbrück wrote, it "effected an internal transformation that increased her military potentiality enormously" while foreshadowing the decline of the Republic's political institutions. Furthermore, the battle exposed the limits of a citizen-militia army. Following Cannae, the Roman army gradually developed into a professional force: the nucleus of Scipio's army at Zama was composed of veterans who had been fighting the Carthaginians in Hispania for nearly sixteen years, and had been moulded into a superb fighting force. Few battles of ancient times are more marked by ability... than the battle of Cannae. The position was such as to place every advantage on Hannibal's side. The manner in which the far from perfect Hispanic and Gallic foot was advanced in a wedge in echelon... was first held there and then withdrawn step by step, until it had the reached the converse position... is a simple masterpiece of battle tactics. The advance at the proper moment of the African infantry, and its wheel right and left upon the flanks of the disordered and crowded Roman legionaries, is far beyond praise. The whole battle, from the Carthaginian standpoint, is a consummate piece of art, having no superior, few equal, examples in the history of war. As Will Durant wrote, "It was a supreme example of generalship, never bettered in history... and it set the lines of military tactics for 2,000 years". Hannibal's double envelopment at Cannae is often viewed as one of the greatest battlefield maneuvers in history, and is cited as the first successful use of the pincer movement within the Western world to be recorded in detail. Schlieffen later developed his own operational doctrine in a series of articles, many of which were translated and published in a work entitled Cannae. In 1991, general Norman Schwarzkopf Jr., commander of Coalition forces in the Gulf War, cited Hannibal's triumph at Cannae as inspiration for the rapid and successful Coalition operations during the conflict. There are three main accounts of the battle, none of them contemporary. The closest is Polybius, who wrote his account 50 years after the battle. Livy wrote in the time of Augustus, and Appian later still. Appian's account describes events that have no relation with those of Livy and Polybius. Polybius portrays the battle as the ultimate nadir of Roman fortunes, functioning as a literary device such that the subsequent Roman recovery is more dramatic. For example, some argue that his casualty figures are exaggerated—"more symbolic than factual". Livy portrays the Senate in the role of hero and hence assigns blame for the Roman defeat to the low-born Varro. Blaming Varro also serves to lift blame from the Roman soldiers, whom Livy has a tendency to idealize. Scholars tend to discount Appian's account. The verdict of Philip Sabin—"a worthless farrago"—is typical. Historian Martin Samuels has questioned whether it was in fact Varro in command on the day on the grounds that Paullus may have been in command on the right. The warm reception that Varro received after the battle from the Senate was in striking contrast to the savage criticism meted out to other commanders. Samuels doubts whether Varro would have been received with such warmth had he been in command. Gregory Daly notes that, in the Roman military, the right was always the place of command. He suggests that at the Battle of Zama Hannibal was quoted saying that he had fought Paullus at Cannae and concludes that it is impossible to be sure who was in command on the day. ^ Although some authors state the result was a decisive victory for Carthage, the majority of authors do not apply this label to the result. ^ Goldsworthy 2001, p. 159. ^ Goldsworthy 2001, p. 28. ^ Goldsworthy 2001, p. 33. ^ Goldsworthy 2001, pp. 36–37. ^ Goldsworthy 2001, p. 38. ^ Liddell Hart, Basil. Strategy. New York City, New York: Penguin, 1967. ^ Goldsworthy 2001, p. 40. ^ Goldsworthy 2001, p. 60. ^ a b c d e f g Polybius, Historiae ("The Histories"), iii.107; translated by Evelyn S. Shuckburgh, taken from "Internet Ancient History Sourcebook". Fordham University website. ^ The Cambridge Ancient History VIII: Rome and the Mediterranean 218–133 BC, Cambridge University Press, 1965. ^ a b Daly 2002, p. 119. ^ Daly 2002, pp. 119–120. ^ Goldsworthy 2001, p. 75. ^ a b Goldsworthy 2001, p. 77. ^ a b Goldsworthy 2001, p. 80. ^ Goldsworthy 2001, p. 81. ^ a b Goldsworthy 2001, p. 82. ^ Caven, B. Punic Wars. London: George Werdenfeld and Nicholson Ltd., 1980. ^ Plutarch, Parallel Lives, "Fabius Maximus". ^ Daly 2002, p. 32. ^ Daly 2002, pp. 29–32. ^ Daly 2002, pp. 81–112. ^ Goldsworthy 2001, p. 44. ^ a b c d e Goldsworthy 2001, p. 54. ^ Daly 2002, pp. 107–108. ^ a b Duncan Head, Armies of the Macedonian and Punic Wars (Wargames Research Group, 1983) p. 144. ^ a b Daly 2002, p. 89. ^ Daly 2002, p. 90. ^ Connolly (1998), p. 148. ^ Goldsworthy 2001, p. 100. ^ Goldsworthy 2001, p. 102. ^ a b c d Dodge, Theodore. Hannibal. Cambridge, Massachusetts: Da Capo Press (reprint edition), 1891, ISBN 0-306-81362-9. ^ Mills, Cliff. Hannibal. New York: Chelsea House, 2008. Print. ^ Goldsworthy 2001, p. 110. ^ Goldsworthy 2001, pp. 110–111. ^ a b c Goldsworthy 2001, p. 112. ^ Goldsworthy 2001, p. 108. ^ Goldsworthy 2001, pp. 111–112. ^ Bradford, E. Hannibal. London: Macmillan London Ltd., 1981. ^ Healy 1994, p. 77. ^ a b Healy 1994, p. 84. ^ Goldsworthy 2001, pp. 118–120. ^ Goldsworthy 2001, p. 120. ^ a b c Goldsworthy 2001, p. 126. ^ a b Goldsworthy 2001, p. 149. ^ Goldsworthy 2001, pp. 114–116. ^ Goldsworthy 2001, p. 147. ^ Goldsworthy 2001, p. 148. ^ Goldsworthy 2001, p. 150. ^ Goldsworthy 2001, p. 152. ^ Healy 1994, p. 85. ^ a b Hanson, "Battle of Cannae" The Reader's Companion to Military History, Cowley, Robert and Parker, Geoffrey (edd. ), p. 70. Houghton Mifflin Company, 1996, ISBN 0-395-66969-3. ^ Quintilian. Institutio Oratoria, 8.6.26. ^ Eutropius. Abridgement of Roman History, iii.10. ^ Daly 2002, p. 202. ^ Cantalupi, P. "Le Legioni Romane nella Guerra d'Annibale", Beloch Studi di Storia Antica. ^ Samuels 1990, p. 25. ^ a b Palmer, Robert EA (1997). Rome and Carthage at peace. Stuttgart, F. Steiner. ISBN 978-3-515-07040-9. ^ Delbrück 1964, pp. 353–354. ^ Goldsworthy 2001, pp. 162–163. ^ Delbrück 1964, pp. 354–355. ^ Delbrück 1964, pp. 384–385. ^ Peter Paret, Gordon A. Craig, Felix Gilbert, Makers of Modern Strategy from Machiavelli to the Nuclear Age (Princeton, N.J.: Princeton University Press, 1986), page 337. ^ Theodore Ayrault Dodge, Hannibal (N.Y., N.Y.: Perseus Publishing, 2004), pages 378–379. ^ Will Durant, The Story of Civilization, vol. III (N.Y., N.Y.: Simon and Schuster, 1944), page 51. ^ O'Neill, Timothy R. "Reconnaissance on the Rappahannock Field Manual" (PDF). p. 65. Archived from the original (PDF) on September 30, 2015. Retrieved July 4, 2013. ^ Goldsworthy 2001, p. 180. ^ Daly 2002, pp. 17–18. ^ Daly 2002, pp. 21–23. ^ Daly 2002, pp. 24–25. ^ Sabin, Philip. Lost Battles, p. 183. ^ Samuels 1990, p. 23. 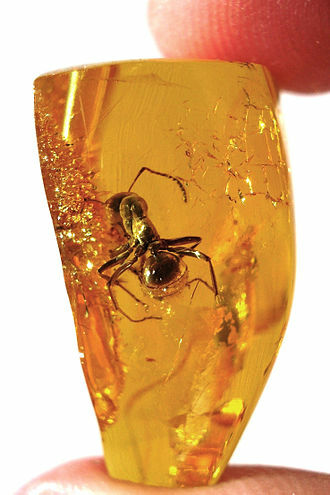 ^ Daly 2002, p. 120. Appian (1999). "Hannibalic War". Perseus Digital Library. Titus Livius (Livy), Ab Urbe Condita, translation by Cannon Roberts. Plutarch (1916). "Life of Fabius Maximus". Loeb Classical Library. Polybius, The Histories, translation by W.R. Paton. Carlton, James. The Military Quotation Book. New York: Thomas Dunne Books, 2002. Daly, Gregory (2002). Cannae: The Experience of Battle in the Second Punic War. London/New York: Routledge. ISBN 978-0-415-32743-5. Delbrück, Hans (1964) . Geschichte der Kriegskunst im Rahmen der politischen Geschichte (I Teil: Das Altertum) (in German). Berlin: Walter de Gruyter & Co.
Goldsworthy, Adrian (2001). Cannae. London: Cassell & Co. ISBN 0304357146. Healy, Mark (1994). "Cannae: Hannibal Smashes Rome's Army". Sterling Heights: Osprey. ISBN 978-1855324701. Lazenby, John Francis (1998) . Hannibal's War: A Military History of the Second Punic War. Wilts: University of Oklahoma Press. ISBN 978-0806130040. Samuels, Martin. (1 June 1990). "The Reality of Cannae". Militärgeschichtliche Zeitschrift. 47 (1): 7–32. Talbert, Richard J. A. (ed.) Atlas of Classical History. London/New York: Routledge, 1985, ISBN 0-415-03463-9. Wikimedia Commons has media related to Battle of Cannae. The battle is mainly remembered today because it triggered one of the most important wars of antiquity, the Second Punic War. After Hannibal was made commander of Iberia at the age of 26. The Romans did nothing against him though they received ample warning of Hannibals preparations, the Romans even went so far as turning their attentions to the Illyrians who had begun to revolt. Because of this, the Romans could not react when news reached them that Hannibal was besieging Saguntum, the capture of Saguntum was essential to Hannibals plan. The city was one of the most fortified in the area, Hannibal was looking for plunder to pay his mercenaries, who were mostly from Africa and the Iberian Peninsula. Finally, the money could be spent on keeping down political opponents in Carthage, other historians doubt whether Hannibal attacked Saguntum deliberately or whether he was provoked by the Saguntians, who had Romes support. Since most of the ancient sources covering this period are pro-Roman. However, Rome failed to support their ally during the siege of Saguntum and this might be due to the fact that Romes legion were occupied elsewhere or might have been a calculated move to have a causa belli against Carthage. Hannibals alleged hatred of Rome and all Romans might have been an idea of Roman propagando to justify the second, the Saguntines turned to Rome for aid, but none was sent. In 218 BC after enduring eight months of siege the Saguntines last defences were finally overrun, Hannibal offered to spare the population on condition that they were willing to depart from Saguntum, each with two garments. When they declined the offer and began to sabotage the towns wealth and possessions and this marked the beginning of the Second Punic War. Hannibal now had a base from which he could supply his forces with food, after the siege, Hannibal attempted to gain the support of the Carthaginian Senate. In this episode however, Hannibal was able to gain limited support which permitted him to move to Carthago Nova where he gathered his men, Hannibal briefly undertook a religious pilgrimage before beginning his march toward the Pyrenees, the Alps, and Rome itself. The next phase of the war was marked by extraordinary Carthaginian victories at Trebia, Lake Trasimene, at the end of the 1st century AD the siege of Saguntum was described with much detail by the Latin author Silius Italicus in his epic poem Punica. The immediate result was a Carthaginian victory in which both Roman brothers were killed. Before this defeat, the brothers had spent seven years campaigning in Hispania, which had limited the resources available to Hannibal, who was simultaneously fighting the Romans in Italy. This double battle represents the only Carthaginian victory in a land battle during the Second Punic War in which Hannibal was not in command of the Carthaginian armies. After the defeat of Hasdrubal Barca in the Battle of Dertosa in the spring of 215 BC and they proceeded to win over some Iberian tribes, raid Carthaginian lands south of the Ebro, with Publius Scipio raiding as far as Saguntum in 214 BC. Both the Romans and Carthaginians faced and put down Iberian tribal revolts, the Scipios received no reinforcement from Italy, where Hannibal Barca had the Romans hard pressed. Meanwhile, Hasdrubal had been reinforced by two armies, led respectively by his brother, Mago Barca, and Hasdrubal Gisco. These armies fought several battles with the Scipio brothers during 215-211 BC. The Scipios had persuaded Syphax, a Numidian king, to open hostilities against Carthage with a Roman trained army in 213 BC. On the whole, the situation in Iberia was stable enough for Hasdrubal Barca to shift his attention to Africa in 213/212 BC in order to put down this rebellion. Hasdrubal Barca returned to Iberia in late 212 BC, bringing with him 3,000 Numidians under Masinissa, the Scipio brothers had hired 20,000 Celt-Iberian mercenaries to reinforce their army of 30,000 foot and 3,000 horse. Observing that the Carthaginian armies were deployed separately from each other, Publius Scipio led 20,000 Roman and allied soldiers to attack Mago Barca near Castulo, while Gnaeus Scipio took one double legion and the mercenaries to attack Hasdrubal Barca. This stratagem would lead to two battles, the Battle of Castulo and the Battle of Ilorca, which took place within a few days of each other, Gnaeus Scipio arrived at his objective first. However, Hasdrubal Barca had already ordered the armies of Indibilis and Mandonius, Hasdrubal Barca held his ground against Gnaeus Scipio, staying within his fortified camp, managed to bribe the Celt-Iberian mercenaries to desert Gnaeus Scipio. The Battle of Ticinus was a battle of the Second Punic War fought between the Carthaginian forces of Hannibal and the Romans under Publius Cornelius Scipio in November 218 BC. The battle took place in the country of Pavia county on the right bank of the Ticino River. The battle is named from the river, not the nearby settlement of Ticinum. The conflict would have been west of there and it was the first battle of the war against the Romans that was fought on Italian soil and the first battle of the war to employ legion-sized forces. Its loss by the Romans, and the disablement of Scipios command. This battle was mainly a cavalry engagement and it was so fast-moving that the javelin-throwers deployed by the Romans had no chance of firing even a single volley and milled around on the field, a major cause of the Roman defeat. Scipio was wounded and barely escaped with his life and he was in fact rescued on the field by his 18-year-old son, the Scipio Africanus. The two main sources on the battle are the History of Rome by Livy and Histories of Polybius, Polybius makes it clear in his account that he visited the places and monuments and looked at documents. The two vary in some of the details and he had been voted commander by the army in Iberia on the assassination of the previous commander, Hasdrubal, in 221 BC. Hasdrubal had ruled by diplomacy rather than by victory, the military commander was the provincial governor. He did not need the permission of the Carthaginian Senate to conduct operations, from 226 BC, the Romans and Carthaginians were bound by a treaty specifying the Ebro River as the boundary between the two interests. The Romans were not to operate south of it nor the Carthaginians north, an exception was made for the large town of Saguntum, whose ruins are located just north of Valencia, south of the Ebro. At some unspecified time, Rome had made a treaty with it. This made it a key element to Carthage, but not Rome, having subdued all the tribes south of the Ebro, Hannibal undertook the siege of Saguntum in 219 BC with 15,000 men. After holding out for months, Saguntum sent envoys to Rome asking for assistance. These arrived at the beginning of the consulships of Publius Cornelius and Tiberius Sempronius, after hearing from the envoys, the Roman Senate resolved to send Publius Valerius Flaccus and Quintus Baebius Tamphilus to Hannibal at Saguntum to demand that he cease and desist. Roman Italy was created officially by the Roman emperor Augustus with the Latin name Italia. It was the first time in history that the Italian Peninsula was united under the same name, in the year 292, the three islands of Corsica and Sicily were added to Roman Italy by Diocletian. Roman Italy remained united until the sixth century, when it was divided between the Byzantine Empire and territories of the Germanic peoples, since then, Italia remained divided for nearly thirteen centuries until 1861 when it was reunited in a similar way in the modern Kingdom of Italy. Italy was the name of the division of the Italian Peninsula during the Roman era. It was not a province, but became the territory of the city of Rome, following the end of the Social War, Rome had allowed its Italian allies full rights in Roman society and granted the Roman citizenship to all the Italic peoples. Although not founded as a city in 330, Constantinople gained in importance. It finally gained the rank of capital when given an urban prefect in 359. In 402, the capital was moved to Ravenna from Milan, the name Italia covered an area whose borders evolved over time. Under Augustus, the peoples of todays Aosta Valley and of the western and northern Alps were subjugated, and the Italian eastern border was brought to the Arsia in Istria. 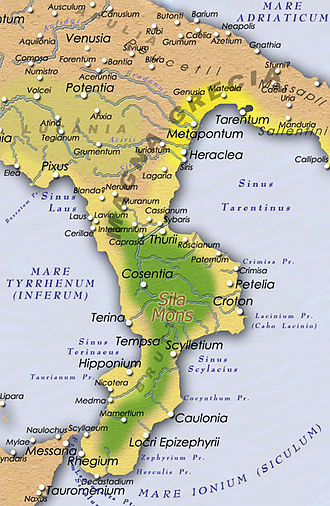 Finally, in the late 3rd century, Italy came to include the islands of Corsica and Sardinia and Sicily, as well as Raetia, the city of Emona was the easternmost town of Italy. At the beginning of the era, Italy was a collection of territories with different political statuses. Some cities, called municipia, had independence from Rome, while others. The Italian economy flourished, agriculture and industry had a sensible growth, the Italian population may have grown as well, three census were ordered by Augustus, to record the number of Roman citizens throughout the empire. The surviving totals were 4,063,000 in 28 BC,4,233,000 in 8 BC, and 4,937,000 in AD14, but it is still debated whether these counted all citizens, all adult male citizens, or citizens sui iuris. The Battle of Lake Trasimene was a major battle in the Second Punic War. The Carthaginians under Hannibal defeated the Romans under the consul Gaius Flaminius, hannibal’s victory over the Roman army at Lake Trasimene remains, in terms of the number of men involved, the largest ambush in military history. In the prelude to the battle, Hannibal achieved the earliest known example of a turning movement. The Romans, greatly alarmed and dismayed by Tiberius Sempronius Longus’ defeat at Trebia, Sempronius returned to Rome and the Roman Senate resolved to elect new consuls the following year in 217 BC. The Senate commissioned Servilius to replace Publius Cornelius Scipio and take command of his army, since both armies had been weakened by the defeat at Trebia, four new legions were raised. These new forces, together with the remains of the army, were divided between the two consuls. After the battles of Ticinus and Trebia, Flaminius army turned south to prepare a defence near Rome itself, Hannibal immediately followed, but marched faster and soon passed the Roman army. Flaminius was forced to increase the speed of his march in order to bring Hannibal to battle before reaching the city, another force under Servilius was due to join Flaminius. Before this could happen, Hannibal lured Gaius Flaminius force into a pitched battle, at the same time, Hannibal tried to sever the allegiance of Rome’s allies, by proving that the Republic was powerless to protect them. However, Flaminius remained passively encamped at Arretium, military historian Theodore Ayrault Dodge describes the significance of this maneuver and its intended effects on the campaign, Flaminius stubbornly kept his army in camp. Hannibal decided to march on Apulia, hoping that Flaminius might follow him to a battlefield of his own choosing, eager to exact revenge for the devastation of the countryside, and facing increasing political criticism from Rome, finally marched against Hannibal. Flaminius, like Sempronius, was impetuous and lacking in self-control, however, it proved impossible to argue with the rash Flaminius. Hannibals crossing of the Alps in 218 BC was one of the major events of the Second Punic War, and one of the most celebrated achievements of any military force in ancient warfare. Bypassing Roman and allied land garrisons and Roman naval dominance, Hannibal managed to lead his Carthaginian army over the Alps, after the final Carthaginian naval defeat at the Aegates Islands, the Carthaginians surrendered and accepted defeat in the First Punic War. In addition to this, the Carthaginians were embittered by the loss of Sardinia, after the loss of the war to the Romans, the Romans imposed terms upon the Carthaginians that were designed to make Carthage a tribute-paying city to Rome and simultaneously strip it of its fleet. Those two things went hand in hand, and in spite of opposition to his expedition. His administration of the conquered provinces led Cato the Elder to remark that there was no king equal to Hamilcar Barca. On his first night, Hannibal camped on fairly level ground near the bottom of the Alps, in 228 BC, Hamilcar was killed, witnessed by Hannibal, during a campaign against the Celtic natives of the peninsula. There were a number of Grecian colonies along the eastern coast of the Iberian peninsula and these colonies expressed concern about the consolidation of Carthaginian power on the peninsula, which Hasdrubals deft military leadership and diplomatic skill procured. The conclusion of the treaty and the embassy were sent to Hasdrubals camp in 226 BC, in 221 BC, Hasdrubal was killed by an assassin. It was in year that the officers of the Carthaginian army in Iberia expressed their high opinion of Hamilcars 29-year-old son, Hannibal. 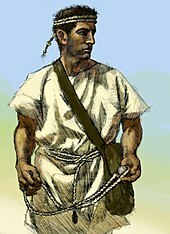 He attacked the tribe known as the Olcades and captured their chief town of Althaea, a number of the neighboring tribes were astonished at the vigor and rapacity of this attack, as a result of which they submitted to the Carthaginians. He received tribute from all of these recently subjugated tribes, and marched his army back to Cartagena and Saguntum were now the only areas of the peninsula not in Hannibals possession. Hannibal was informed of Roman politics, and saw that this was the time to attack. The Samnites were an ancient Italic people who lived in Samnium in south-central Italy. They became involved in wars with the Roman Republic until the 1st century BC. An Oscan-speaking people, the Samnites probably originated as an offshoot of the Sabines, the Samnites formed a confederation, consisting of four tribes, the Hirpini, Caudini and Pentri. They allied with Rome against the Gauls in 354 BC, despite an overwhelming victory over the Romans at the Battle of the Caudine Forks, the Samnites were eventually subjugated. Although severely weakened, the Samnites helped Pyrrhus and Hannibal in their wars against Rome, by 82 BC, the Roman dictator Lucius Cornelius Sulla conducted an ethnic cleansing campaign against the Samnites, after which they disappeared from history. The population of Samnium were called Samnites by the Romans and their own endonyms were Safinim for the country and Safineis for the people. Etymologically, the name Samnium is generally recognized to be a form of the name of the Sabines, from Safinim, Sabinus and Samnis, an Indo-European root can be extracted, *sabh-, which becomes Sab- in Latino-Faliscan and Saf- in Osco-Umbrian, Sabini and *Safineis. The eponymous god of the Sabines, seems to support this view, the Greek terms and Saunitis, remain outside the group. Nothing is known of their origin, at some point in prehistory, a population speaking a common language extended over both Samnium and Umbria. Salmon conjectures that it was common Italic and puts forward a date of 600 BC and this date does not necessarily correspond to any historical or archaeological evidence, developing a synthetic view of the ethnology of proto-historic Italy is an incomplete and ongoing task. Linguist Julius Pokorny carries the etymology somewhat further back, the earliest written record of the people is a treaty with the Romans from 354 BC, which set their border at the Liris River. Shortly thereafter, the Samnite Wars broke out, they won an important battle against the Roman army in 321 BC, by 290 BC, the Romans were able to break the Samnites power after some hard fought battles. The Samnites were one of the Italian peoples that allied with King Pyrrhus of Epirus during the Pyrrhic War and they joined and aided Hannibal during the Second Punic War. The Battle of the Silarus was fought in 212 BC between Hannibals army and a Roman force led by praetor Marcus Centenius Penula. The Carthaginians were victorious, destroying the entire Roman army and this is one of the few battles where Hannibal commanded an army larger than his foes. Hannibal had lifted the siege of Capua after mauling two Roman consular armies in the battle of Capua, the Roman consuls had split their forces, with Flavius Flaccus moving towards Cumae, while Appius Claudius marched towards Lucania. It is not sure why they had done so, because their forces still outnumbered Hannibals army,8,000 soldiers were detached to serve under him, possibly from the army of Gracchus which was stationed in Lucania. To this force another 8,000 volunteers from Campania, while Appius Claudius with his consular army marched west to join his fellow consul, Centenius set off to pursue Hannibal. In Iberia, the situation remained deadlocked, neither the Scipios nor the Barcids gained any decisive advantage. The Siege of Syracuse continued in Sicily, hanno the Elder remained active in Bruttium. Although Centenius was a soldier, his generalship left much to be desired. According to Livy, he had no idea about the whereabouts of the Carthaginian army, Hannibals scouts were able to locate the Roman army before the Romans got wind of anything. Marcus Centenius and his army were ambushed by Hannibal and the Roman forces were completely routed, the Roman cause was made worse by the fact their Etruscan allies fled, creating panic in the ranks. Hannibal surrounded the remaining Romans and hacked them down and he took Marcuss ring from his finger and tried to use it in Marcuss name but to no avail. Once again the Romans showed their persistence by refusal to surrender to Hannibal, Hannibal was still unbeaten on Italian soil. In terms of casualties inflicted, this battle ranks after Cannae among the battles Hannibal had fought and it is said that out of 16,000 Romans, only 1,000 survived. These survivors were sent to join the disgraced legions of Cannae survivors after they had rounded up. The Battle of Ager Falernus was a skirmish during the Second Punic War between the armies of Rome and Carthage. After winning the Battle of Lake Trasimene in Italy in 217 BC, the Carthaginians ultimately moved into the district of Falernum, a very fertile river valley surrounded by mountains. He now occupied all the crossings and mountain passes leading out of the valley. After stripping the area of grain and other supplies, despite the protests of his staff officers Fabius, who was camped near the pass with his main forces, refused to attack the Carthaginian army and it escaped the trap unscathed. The Carthaginian victory in the Battle of Lake Trasimene had removed the Roman consular army which had prevented the Carthaginians from marching on Rome, the Roman army retreated back to Ariminum after this debacle, and was busy checking the Gallic raids taking place near the Po valley. The initiative now rested with Hannibal, and the Romans had temporarily lost the ability to defend their Italian allies until a new army could be raised. It is a matter of speculation why Hannibal did not march on Rome or what might have happened had he done so immediately after Trasimene, all the while ravaging the countryside, marched through Picenum towards the Adriatic coast, reaching Herita 10 days after leaving Lake Trasimene. With no Roman army situated near him, Hannibal was free to choose his next course of action unhindered, the Senate met in continual session to debate the next course of action until three days the news of the defeat of the Roman cavalry by Maharbal arrived in Rome. The Roman senate and the people, realizing the gravity of the situation, as one of the elected consuls was dead and the other one away with his army, the dictator was elected by the senate instead of being nominated by one of the consuls. Fabius,58 years of age, nearly 30 years older than Hannibal, normally a dictator chose his own deputy, the Master of Horse, but Fabius received as his Master of Horse Marcus Minucius Rufus, in an unusual political gesture. 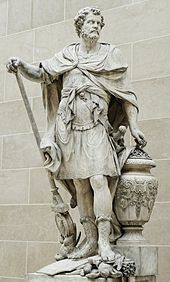 It was suggested that the post of Fabius was that of a pro-dictator, the Romans needed to prepare a proper reception should Hannibal decided to show up outside Rome with his army. Fabius first set about restoring the morale of the Roman people, the senate consulted the Sibylline Books at the suggestion of Fabius and a praetor was assigned to appease the Roman gods through generous sacrifices. Divine duties taken care of, Fabius next went about preparing for Hannibals anticipated visit to Latium, being ignorant of his location and intention at that time. The city walls were repaired, Minucius was put in charge of preparing a reception committee by raising 2 Roman and 2 allied legions, the unwalled towns in Latium were ordered to be abandoned, and their inhabitants were moved into walled towns. Certain bridges were torn down to deny the Carthaginians easy passage through Latium, once it was clear that Hannibal was not marching towards Rome, Fabius ordered the army of Servilius into Latium. Servilus was sent to command the Roman fleet at Ostia with the rank of proconsul, with the Roman army concentrated, Fabius needed to implement the next phase of his plans, how to defeat the Carthaginian army. The Trebbia today at Rivergaro, at the foot of the hills in which Scipio sought refuge from Hannibal's army. Cisalpine Gaul in 218 BC, depicting the Boii revolt and the Carthaginian invasion. Samnite soldiers from a tomb frieze in Nola 4th century BC. Roman coin portraying Hercules from Oria, the most ancient Iapygian city. 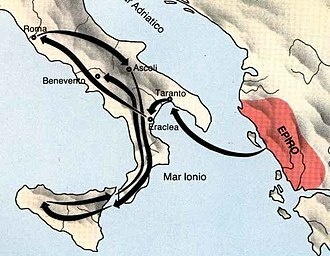 The campaign of 214 BC in Campania. Roman operations in Spain, 218–211 BC. Included are several probably ahistorical engagements.